In the first post I would like to give you a quick rundown on the 5 month of making the Collapse: Space Supremacy. -making accounts on app stores. Of course knowledge of Java is a must. No frameworks or special libs are required though. Just simple old Java - also no fancy things from Java 8. As for the LibGDX, no special expertise is required. I started after 2 weeks of learning it (before that I hadn't even known about LibGDX). All my knowledge comes mainly from a book "Learning LibGDX Game Development" by Suryakumar Balakrishnan Nair and Andreas Oehlke. It's not perfect but it's a good start. Also of course a lot of the Internet. I didn't use any special libs except for postprocessing by Bitfire. It actually cause more problems than was of a benefit. The most obstacles were caused by Box2d and my lack of knowledge of it. It was really hard to compose world units with screen units. Also adding admob service was like a nightmare. I used Eclipse Luna and gdx-setup.jar installer. Then I imported everything using Grandle import. The above mentioned book has good tutorial on installing, but I would lie if I said that everything went just as it was described. LibGdx is a good library. No one has said it was perfect and it isn't. It doesn't have steep learning curve. My biggest charge against libgdx is the memory management. It is not very forgiving when it comes to releasing resources. I hope this short text can help someone choose the LibGDX as his/her first game library. Feel free to test my game. Steam achievements in Java(libgdx). Step by step for dummies. In this tutorial I will present in a rather comprehensive way the implementation of Steam's achievements in Java. I used the libgdx framework, but the tutorial should apply regardless of the technology used, if it is java. The tutorial was tested only for a desktop game (Windows). I must also mention that I tested adding achievements on a game that had been already released, but the same procedure should also apply to a game in a beta state. In addition, I used Eclipse and the standard structure of projects for libgdx, i.e. 3 projects for desktop, core and android (which contains the assets folder). The reactor is the source of energy for the ship. Information about the reactor is shown in the 'Reactor' window. The reactor is powered by a fuel. The available amount of fuel can be seen under the name "Fuel". This amount changes in time depending on the level of energy supplied (position - Current). 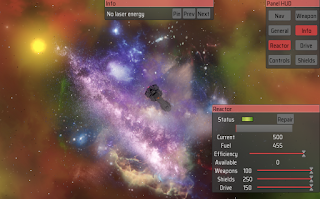 The energy from the reactor is divided into three systems: Drive, Shields and Weapons. Total reduction of energy for a particular system results in its complete shutting down. Damage to the rector also results in the shutdown of all systems. Lowering the amount of energy for a specific system increases the buffer level (position Available). This allows you to redirect energy to another system. The level of energy and the amount of fuel can be adjusted using the Efficiency slider. Achievementy Steam w Java(libgdx). Przewodnik krok po kroku. W tym tutorialu przedstawię w dość całościowy sposób implementacji achiementów Steama dla języka java. Używałem frameworka libgdx, ale tutorial powinien mieć zastosowania bez względu na użytą technologie o ile to java. Tutorial był testowany tylko dla gry na desktop (Windows). Muszę także wspomnieć, że testowałem dodawanie achievementów na grze już opublikowanej, ale ta sama procedura powinna odnosić się także do gry w wersji beta. Ponadto używam Eclipse i standardowej struktury projektu dla libgdx czyli 3 projekty desktop, core i android (który zawiera katalog assets). Achievementy to usługa Steama pozwalająca na rozszerzenie funkcjonalności naszej gry. To coś do czego dążymy w grze. Zamiast przechodzić główną kampanię można także starać się osiągnąć achievementy, które są widoczne na twoim profilu Steama. To prosty sposób na zwiększenie wartości i żywotności naszej gry.